What do you think of when you hear about things that contribute to “energy saving”? Energy-saving devices such as high-brightness LED lamps and high-efficiency motors readily come to mind. In order to improve the fuel efficiency of motor vehicles, it is important to make them lighter. We have begun to implement measures such as introducing resin gasoline tanks and window panes, as well as creating lighter motors and batteries for electric and hybrid vehicles. Although you rarely notice them, power devices are essential to efficiently regulate electricity. What about “power generation”? If you are thinking about clean energy sources, solar cells and wind power come to mind. We are working to achieve energy saving and power generation from two perspectives. ULVAC’s manufacturing equipment plays a role in the process of creating products that lead to energy saving and power generation Vacuum equipment is essential for the manufacture of power devices, which are necessary for regulating heavy current, as well as long-life, high-brightness LEDs. Furthermore, many vacuum devices are used in the manufacturing process of solar cells, which are representative of power generation. 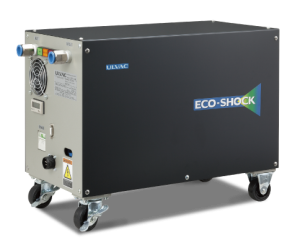 Going forward, the roles that ULVAC vacuum equipment plays in order to produce highly energy-efficient and power-generating products will continue to expand. We are also devoting resources to future development by including the energy saving and power generation fields among the important areas for development, for the realization of safe and secure lifestyles. to freeze-dried products, such as food and pharmaceuticals, and metal melting. We are also pursuing energy-saving features in our vacuum equipment, itself, in order to achieve energy saving at our customers’ factories. Solar cells are representative of renewable energy, and in addition to mega solar projects, we are also working to increase the uptake of solar cells for general household use. In order to achieve higher power-generation performance, we are engaging in a range of initiatives to improve conversion efficiency. Between the 1980s, when solar cells were emerging, and now, ULVAC has been involved with the manufacture of solar cells in a number of different ways. We will continue to contribute to the superior performance of solar cells through vacuum deposition equipment and ion implantation equipment. The move away from fluorescent lamps and incandescent lamps to LED has been continuing at offices and homes, and is emblematic of efforts to save energy. Furthermore, the use of LED lights has been expanding for applications such as outdoor usage, including billboards, and for automobile headlights. ULVAC will contribute to the manufacturing process of various types of LEDs, from conventional to high-brightness, through deposition equipment such as vacuum evaporation and sputtering, as well as PE-CVD equipment, and etching equipment. 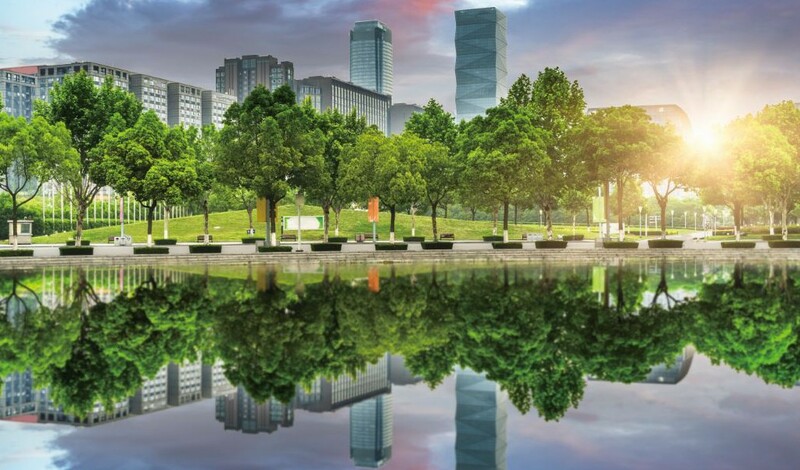 Although we are now seeing many environmentally friendly hybrid cars and EVs (electric vehicles), initiatives aimed at producing next-generation automobiles, such as improving fuel efficiency, are ongoing. One of these initiatives is to make vehicles lighter. We expect a dramatic improvement in the lightness of vehicles by using polycarbonate (PC) resin for side and rear windows. ULVAC will contribute to the lightening and reduction in fuel consumption of next-generation automobiles by coating the resin glazing with a hard film and providing PE-CVD equipment to improve abrasion resistance. When supplying electricity to household appliances, trains, and automobiles, etc., it is necessary to convert the electricity to the correct voltage and frequency, and power devices regulate this. In order to handle higher voltages, minimize energy loss, and increase the speed of conversion, there is a trend toward creating products that use new materials such as SiC and GaN in place of the conventional Si. With our vacuum deposition equipment, etching equipment, and ion implantation equipment, etc., ULVAC will contribute to the production process of power devices that use new materials as well as conventional Si. Freeze drying is a method of drying that involves freezing aqueous solutions or food and reducing the pressure to below the saturated vapor pressure at below-freezing temperatures to sublimate any water content. In addition to food products, it is often used to manufacture pharmaceuticals. Until now, it was standard practice for temperature to be measured by inserting a temperature sensor into the substance to be dried, and for a human operator to judge when the drying process was complete. Operators would often allocate excessive time for fear of leaving residual moisture, which caused time and energy to be wasted. 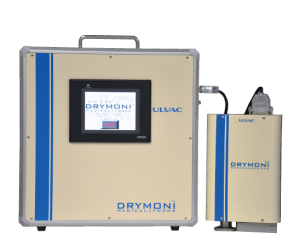 With “DRYMONI”,we have succeeded in creating a “visualization” of the drying process. 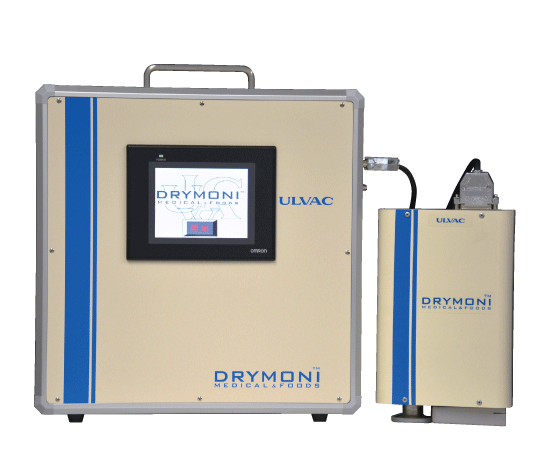 This has been acknowledged in the pharmaceuticals industry, which has strict quality assurance requirements, leading to the fitting of “DRYMONI” to ULVAC vacuum freeze drying equipment. We also stock a standalone type that can be fitted to the precede model of equipment that has already been installed.